Leslie, Lauren and Carol taught their first cooking class at the Ashland Co-op last week! Everything turned out delicious, thanks to those of you who made it. Leslie even brought a huge basket of greens that she offered to the class attendees. Everyone went home full and content, and especially enjoyed the surprise Arugula Pesto Crostini that was passed out at the beginning of the class. Now that her family’s cookbook is published, Leslie Sargent is ready to prepare all-new meals for guests and staff at Buckhorn Springs. “She had to cook it over and over,” says Sargent’s daughter, Lauren, who mined her mother’s memory for recipes and committed them to print over the course of two years. The result is “Buckhorn Springs Heritage Cookbook,” self-published in August. Containing about 100 recipes and photography by Leslie Sargent’s husband, Bruce, the 24-page, hardcover book painstakingly chronicles the story of the historic lodge and retreat fed by mineral springs a dozen miles east of Ashland and pays modern-day tribute to its owners and guests. Profits from the $34.95 book benefit the Sargents’ nonprofit foundation to restore the property, particularly its physiotherapy clinic. Stocked at Ashland Food Co-op, Bloomsbury Books and the Northwest Nature Shop in Ashland, as well as Pot Rack in Jacksonville, the book guides readers through mealtimes at Buckhorn Springs with guests’ favorite dishes. Flavors range from Asian pad Thai and Latin-inspired tacos and quesadillas to Indian and Middle-Eastern specialties. The vast majority vegetarian, the dishes fit easily into mainstream diets incorporating whole grains and vegetables. 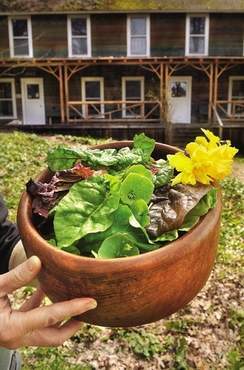 Calling the recipes accessible and prime examples of the region’s cooking, Ashland Food Co-op culinary educator Mary Shaw says the book makes it obvious why Buckhorn Springs enjoys such a strong following. A Thursday Co-op class with Leslie and Lauren Sargent and fellow cook Carol Worthington will give participants a taste of the retreat’s ambiance. “Undoubtedly, they will tell a lot of wonderful stories,” says Shaw. Beyond techniques, the cooks also will share produce grown on Buckhorn’s property by Aiyana Green. The menu of quiche, garden salad and soup will make use of abundant spring greens. A longtime customer of local farmers, Buckhorn should be able to furnish almost all its own vegetables this year, says Leslie Sargent. Green’s efforts, with help from a new colony of bees, yielded enough vegetables to supply a community-supported agriculture program for 14 families, most friends of the Sargents, in Buckhorn’s off-season. Green also has been selling surplus Tuesdays at the Rogue Valley Growers and Crafters Market in Ashland. In the dozen years since the Sargents have eaten a mostly vegetarian diet, they’ve seen some of their staple ingredients, such as quinoa and amaranth, become widely recognized. More recently, guests are citing food allergies and requesting gluten-free dishes even more often than vegan, the Sargents say. 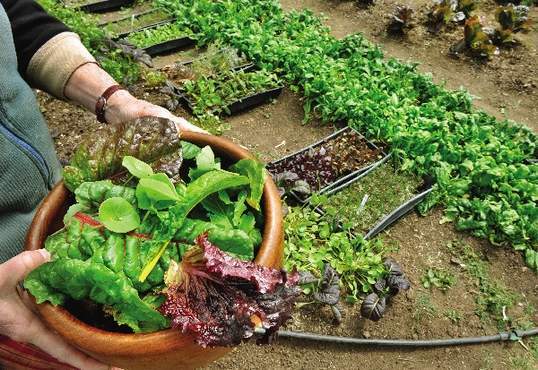 And with more of Buckhorn’s property dedicated to gardening, guests can get better acquainted with their food. “They just love that they can see exactly where it’s coming from,” says Lauren Sargent. Purchase the book or read more about Buckhorn Springs at www.buckhornsprings.org. Reach Food Editor Sarah Lemon at 541-776-4487 or email slemon@mailtribune.com.